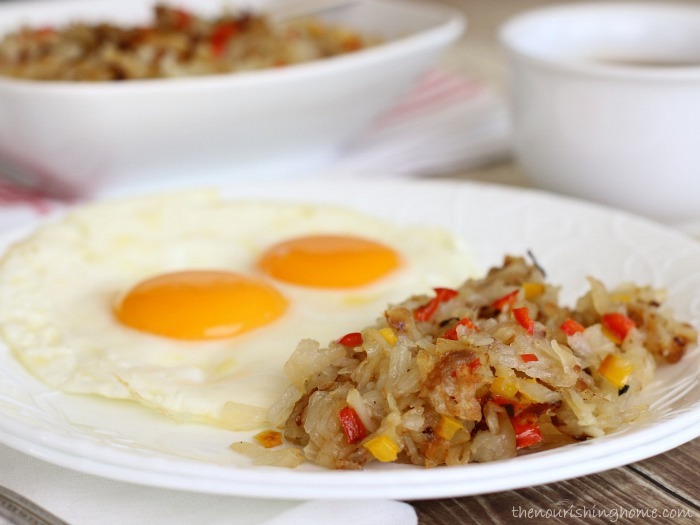 Instead, as you’ve probably guessed from this post – I’m all about breakfast potatoes – homemade hash browns to be exact. 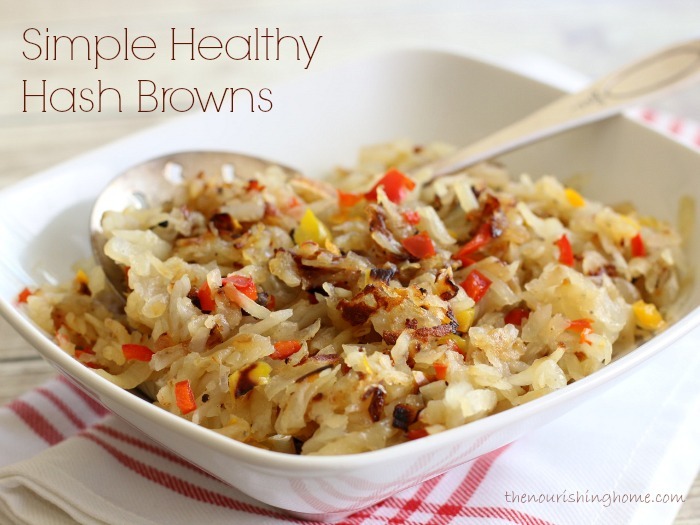 Incase you’ve attempting making hash browns in the past, and have been sorely disappointed in their often soggy, gummy texture, I’ve got good news for you! I’m sharing the secrets to hash brown making perfection that will ensure a crisp and delicious result every time! 1. Proper Potato Prep – Shred potatoes (using a food processor with shred-disc is best, but a box grater will do). Soak shredded potatoes in water to release starches. Thoroughly dry shredded potatoes by pressing between kitchen towels. This is key for crispier results! 2. Seasoning is Your Friend – Be generous in using fine chopped onion and bell pepper, along with sea salt and pepper to turn up the taste! 3. Do Not Disturb! – The process goes like this … Cook undisturbed. Flip potatoes in sections. Cook undisturbed. Flip in sections. Repeat until perfect. Now, let’s put these top tips into action! My savory recipe below has just three simple ingredients. Yet, combined with a little dash of sea salt and pepper, and a whole lot of love, your family will want to kiss you! So … make LOTS, because they’re the perfect side dish whether it’s breakfast or dinnertime. Plus, they keep well in the fridge or freezer, and can easily be reheated in a skillet. P.S. If you’re not fond of white potatoes – no worries – sweet potatoes make unbelievably delicious hash browns too! Dice the onion and pepper first, so that they’re ready to go once you shred the potatoes. Then, peel the potatoes (or leave them unpeeled if you'd prefer). Use a box grater or the shredder attachment on your food processor to shred the potatoes. Be sure to follow the tips in the post above on how to properly prepare your shredded potatoes. Heat a large skillet (preferably cast iron) over medium-high heat. Once hot, add ghee, onion and peppers. Sauté for a minute, then add the shredded potatoes, making sure to evenly distribute across the skillet. Allow potatoes to cook undisturbed for a few minutes, then carefully flip section by section. Continue to cook as noted in tips above, until golden brown. Leftovers Tip: My kids love it when I make breakfast burritos using leftover hash browns. I just beat a couple of eggs and add them to a hot skillet and scramble the potatoes and eggs together. Then, add the potato-egg mixture to warm tortillas, roll them up and serve with a side of pico de gallo and sliced avocado. If you’re grain-free like me, I highly recommend keeping some of Danielle’s amazing GF tortillas on hand. That way, you can enjoy the burrito fiesta as well! These look fabulous! I’m making them tomorrow! I did try them and they were great! I didn’t peel them since I like peels. But they didn’t crisp up very well even after I cooked them. Do I leave the top on or off the frying pan? They were very tasty for sure. I don’t cover them and it’s important not to turn them for at least 4 minutes so they can brown at the bottom. They do not crisp like a typical hashbrown, because they are not deep fried. But they will have a few crispy pieces mixed in from browning. 🙂 Glad you enjoyed the recipe! Thanks for taking the time to leave a kind note! OK! They are so good and I will be making them again because they were easy too. 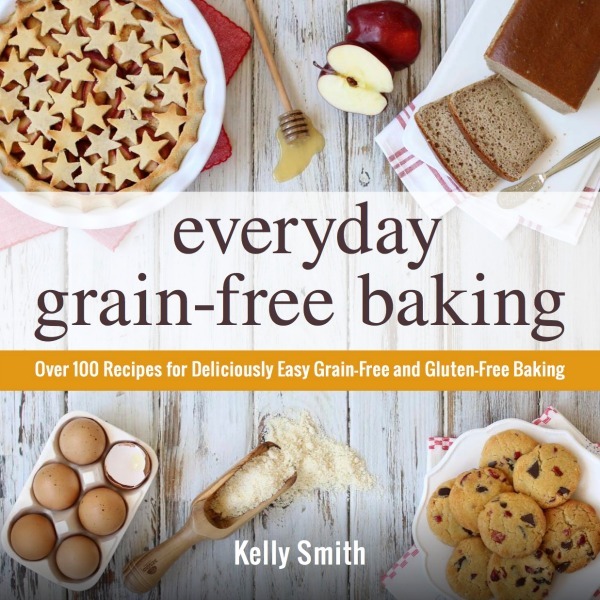 Hi Kelly, love your website and your recipes. Thank you. Do you have to peel the potatoes? I have read that most of the goodness is just under the skin so I am always reluctant to peel them. I think my potatoes were probably bigger than yours because my 12″ skillet had kind of a thick layer that didn’t cook all the way through. The veggies were also undetectable (which could be good for some families, of course!). Do you have an approximate weight of potatoes that you typically use? They did taste good, so we plan to make them again! Thanks so much for your quick response! That would definitely explain things. 🙂 I appreciate all you do (and so does my husband when we use one of your great recipes, lol)! Do you cook the hash browns in a non-stick pan or a cast iron pan? Can the potatoes be grated the night before to make morning prep faster or will they go bad overnight? In over 30 years of cooking fried potatoes as home fries or hashbrowns, I could never get that lovely golden brown crispy coating UNTIL I got a cast iron fry pan. Also, a trick I learned while watching the cook at a local homestyle restaurant — aka ‘greasy spoon diner’ — is to add just a little water at the end to help release the crispy crust. I followed your recipe with a twist-I added fine chopped organic spinach and one fine chopped habanero pepper. The hash was delicious. I made enough to for another day, thanks for this healthy recipe. I could not believe the quantity of starch/carbohydrate that was at the bottom of the bowl. Great idea, Kelly, soaking hash, removing from water, then drying hash reduced calories from my diet, again, thank you!